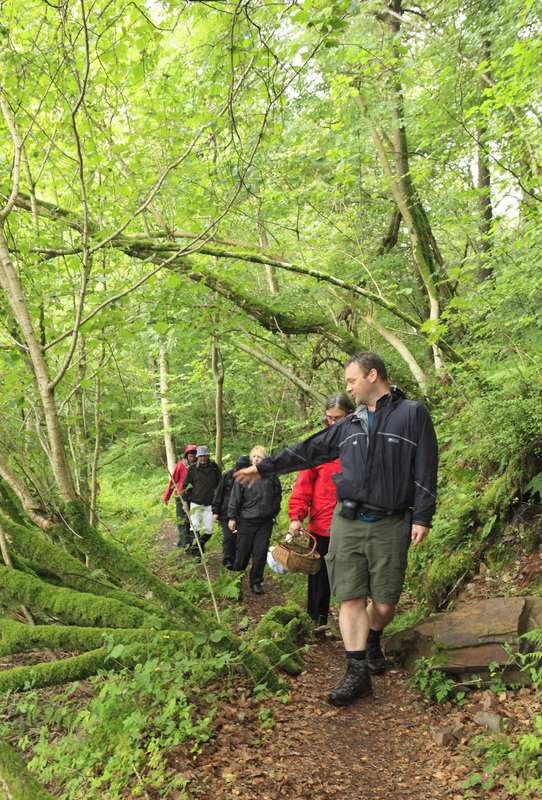 In late July I took several city friends on a foray in one of Galloway’s lovely hidden woods that harbours a gorgeous gorge and a great range of mushrooms for a small area. 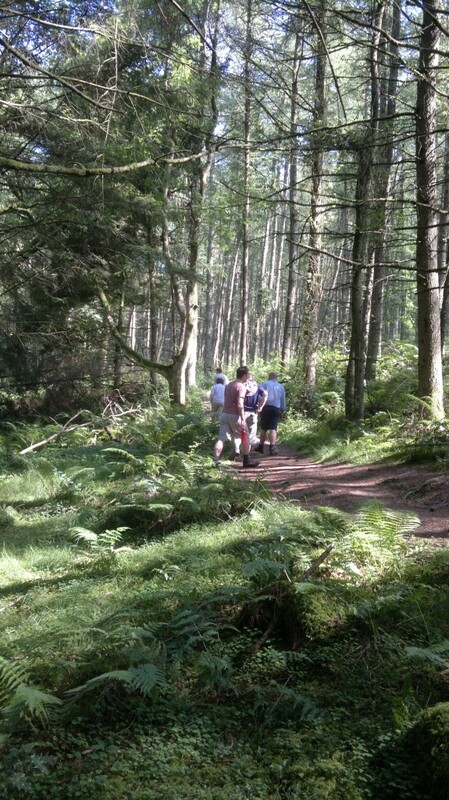 It was a stunning summer day after a night of revelry, so the cool, shady woods was the perfect place to nurture our hangovers. 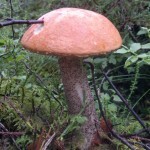 We found lots of interest and there was plenty of competition for the accolade of ‘best mushroom spotter’. 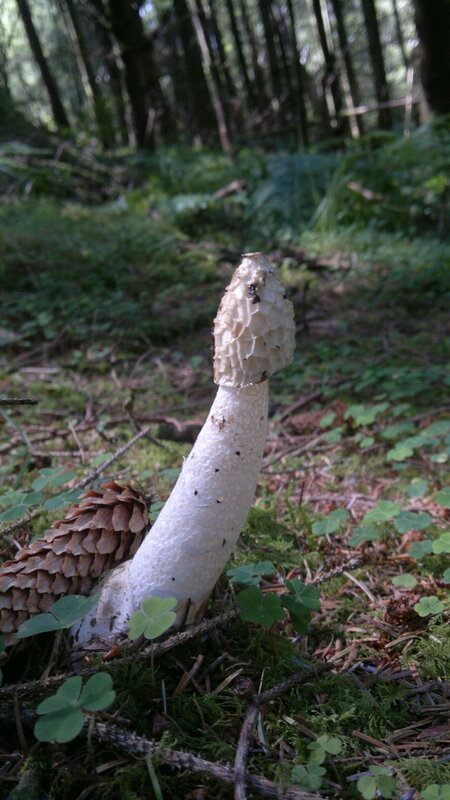 Stinkhorns, as always, were a source of great amusement – once people had got over the shock of the witch’s egg from which they grow. 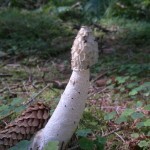 For those of you who haven’t encountered this fairly common ‘mushroom’, it is aptly named, looking very phallic and smelling very strongly of decaying flesh. Normally you smell them long before you find them. 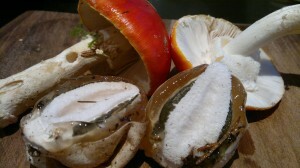 Rather than just dropping spores through pores or gills on the underside of the cap like many mushrooms, the stinkhorn relies on flies attracted to its foetid stench to do the job. 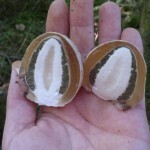 I imagine you will be pulling a face when I say that this is an edible mushroom when it is still in its egg/gonad form. 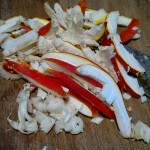 First you have to remove the outer skin, layer of slime and gooey green spore layer (not yet at full pungency). Yum. Not. 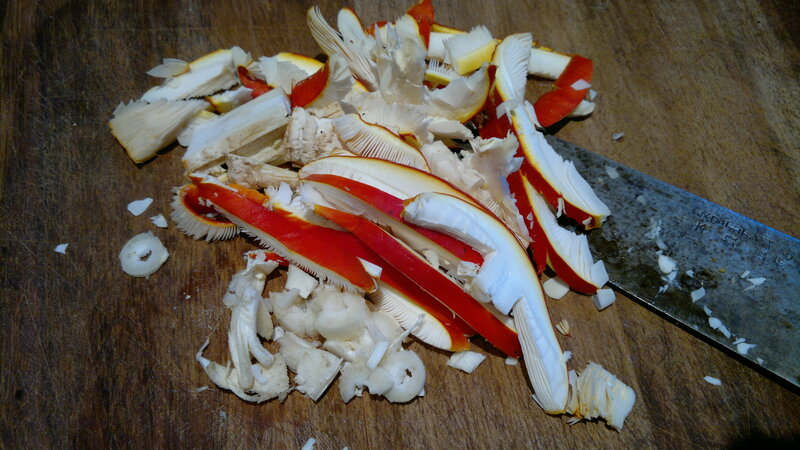 Things got gradually more appealing with some blushers, an early flush of fly agaric (both of which require careful preparation before eating – see this article) and then some beautiful bouchon cep which we sliced up and devoured on the spot. 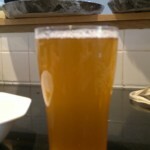 The aromatic chestnut and earthy flavours really tasted like the forest. After that it was chanterelles all the way, and we lazily meandered our way along the riverbank picking out the choicest specimens before flopping down for a picnic of smoked eggs, fine salami, camembert and freshly picked blaeberries (always a great by-product of a fungi forage) washed down with elderflower champagne and nice nap in the sun. I can’t think of a better way to work out a hangover with friends. 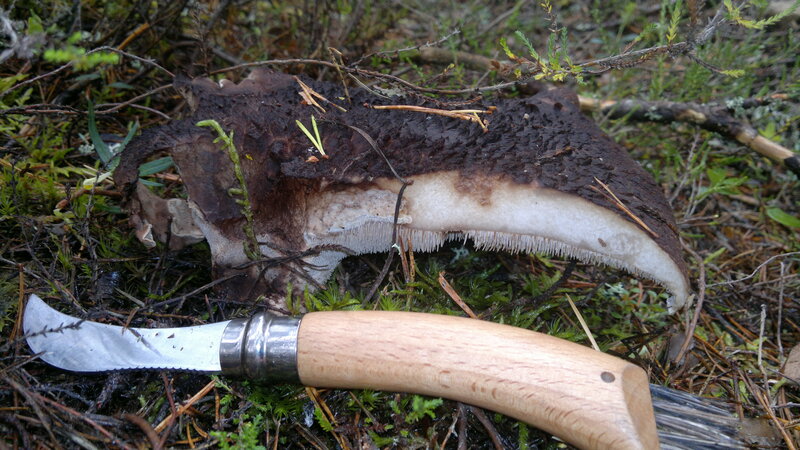 The next day started with an interesting breakfast of fly agaric. This is not something I do regularly, them being both hallucinogenic and dangerously toxic, but I am demonstrating how to prepare them safely at an exhibition in September, so felt I ought to get a bit of practice in. 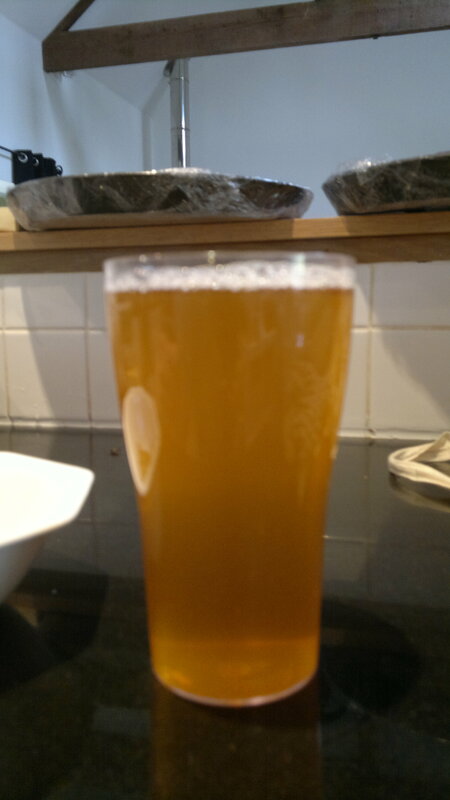 The trick is to blanche out all the water-soluble chemicals (ibutonic acid and muscimol are the active ingredients) to leave delicious, tasty mushroom and toxic amber liquid that looks quite like a pint of Arran Blonde Ale from the bottom of the barrel. I don’t treat this process lightly and nor should you, but if you do want to give it a go this article tells you all you need to know, and makes fascinating reading even if you don’t. In case you’re wondering, they were tasty and I remained non-potty. 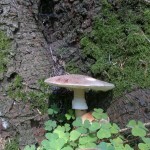 After prepping my mile-high-wild-pie with some of the previous day’s chanterelle haul, it was off to meet some artists for a foray intended to inspire them for a forthcoming exhibition of fungi inspired art (see foraging events calendar for more information). After Saturday’s blazing sun, this was a more typical summer day of low cloud and steady rain – perfect for an afternoon in the woods (see how I can’t lose?). I fortified the intrepid painters with a dram of sloe gin (last of my stash) before we set off into a gorgeous bit of old beech and birch woodland on the outskirts of the forest park. 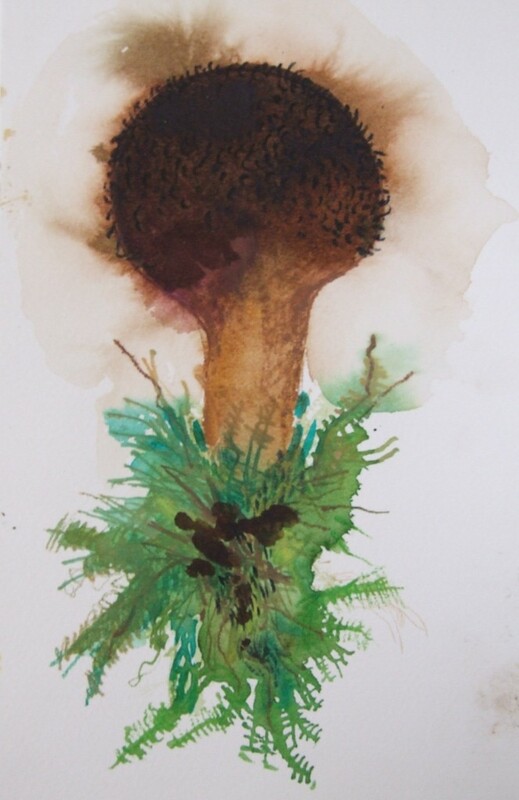 This was a unique forage for me, in that the focus was not entirely on what was or was not edible, and I think the artists got really into fungi for its weird beauty and mysterious nature as much as anything else. 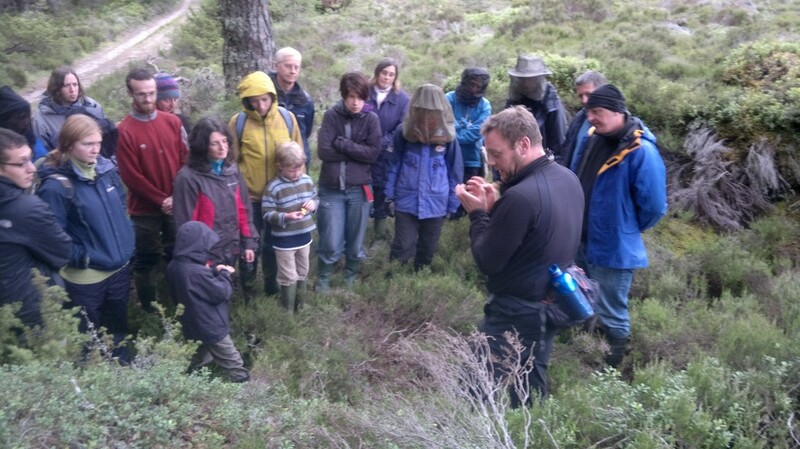 For my part, I thoroughly enjoyed being able to bang on about all kinds of fungi to a receptive/captive audience. 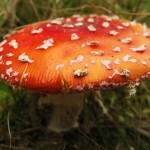 Despite it being nearly 2 months short of prime mushroom season, we found loads of really interesting and inspiring fungi. I am going to resist the temptation to reveal what we found – you will have to come along to the exhibition at Devorgilla Gallery, Dumfries to find out. If you come on Saturday 3rd September (free, but booking required) I will be there along with the artists and you will get some foraged treats to try too. But I can’t resist showing you this little illustration by Carol Taylor to whet your appetite. I think it really captures the spirit of puffballs and can’t wait to see her finished works. We followed a beautiful moss-banked stream to a hidden loch that seemed to be brooding in the soft light and smurr before making our way back to the cars and a short trip to my home in Gatahouse for a feast of mile-high wild pie, cep and Kilnford bacon tart and Cara’s fine bread and stem ginger cake. 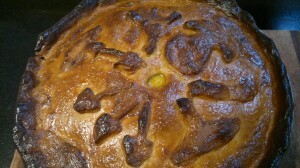 Mile-high wild pie. Experts should be able to identify my pastry mushrooms! Another great day and i’m really excited to see the art that comes out of it. 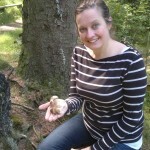 Our good friend Alison works for the RSPB Abernethy Nature Reserve near Boat of Garten just North of Aviemore. 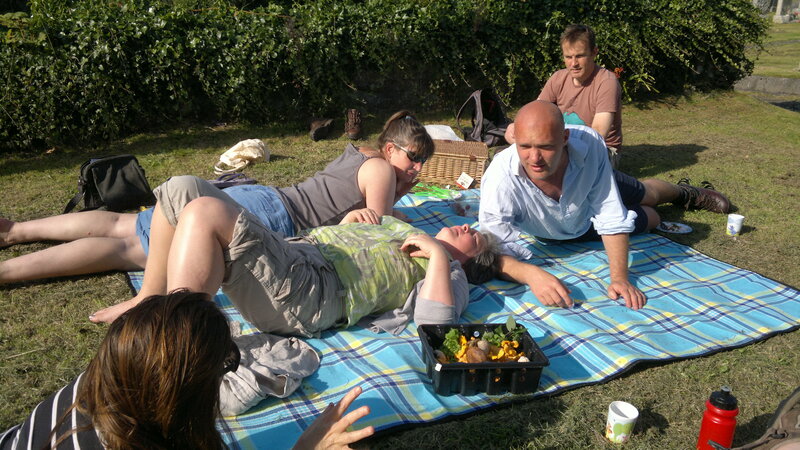 This makes us lucky on two counts: firstly, Alison is great fun to hang out with and incredibly knowledgeable and passionate about all things wild, in a way that makes you want to give up everything and become a full time naturalist like she did. 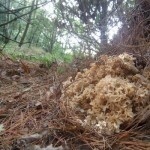 Secondly, she happens to live in one of the most amazing and extensive areas of truly wild (scots)pine forest in Scotland, which also happens to be near Speyside – the fungi capital of the UK. As you can imagine, we didn’t need inviting twice. In fact we didn’t need inviting at all. 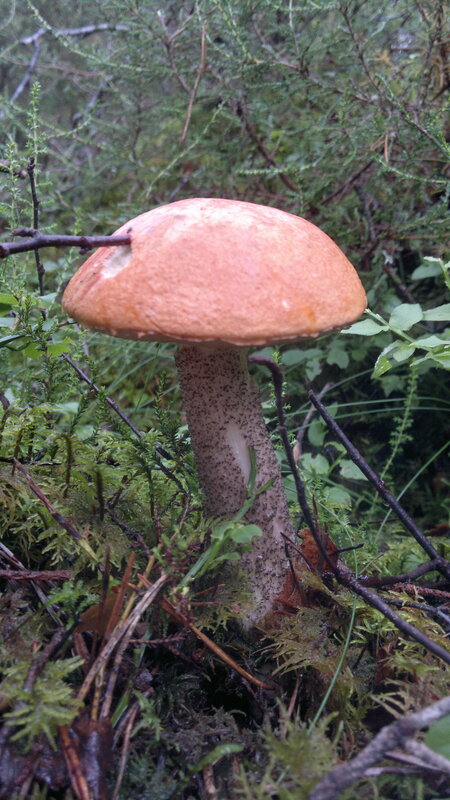 We rocked up with our borrowed campervan in some pretty hideous weather, but fungi love the rain, so I do too. A short walk with Alison on our first night and I realised that not only were my shrooming skills rusty (they oxidise through the off season), but there was a big hole in my wild food knowledge of proper highland scots pine forest. Fortunately. 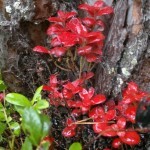 Alison soon got me up to speed identifying cowberry and crowberry and I began to reacquaint myself with some fungi I hadn’t seen for a while. 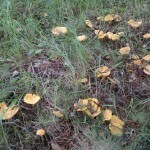 Saffron milk cap (delicious, but normally full of maggots), cowberry and crowberry (not yet fruiting). 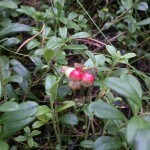 Neither berry tastes as good as blaeberries, which also grew in profusion. 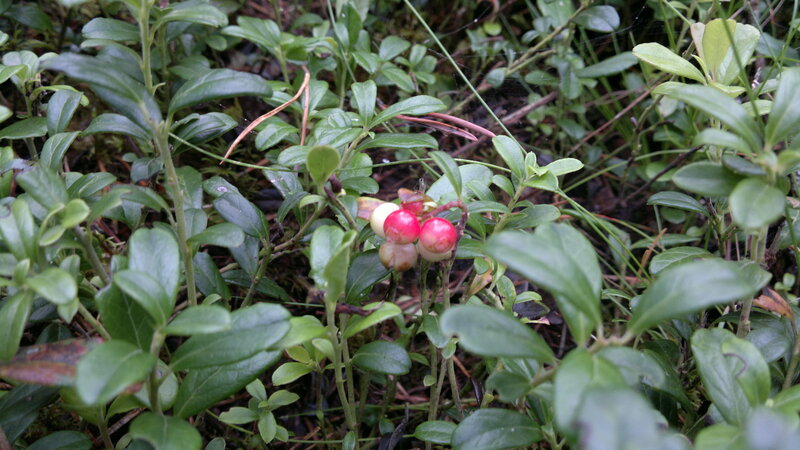 Cowberry was pretty much the dominant ground cover for large areas so the wayside snacking was fairly constant. 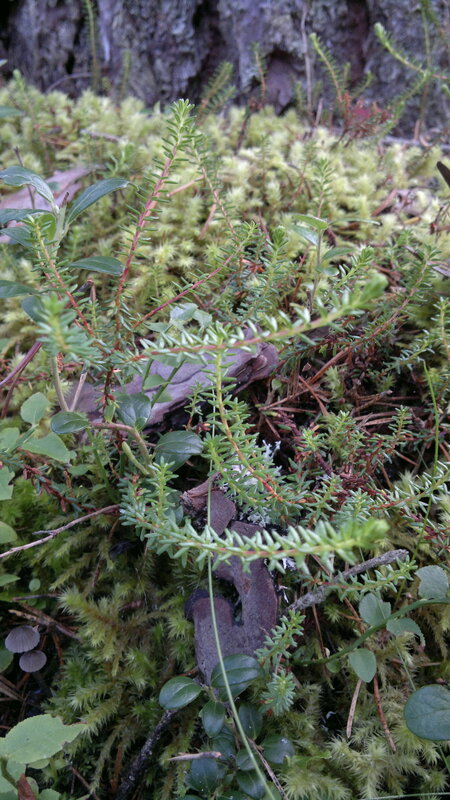 Many of the plants were being parasitised by a fungi called cowberry redleaf (exobasidium vaccinii) which does exactly what its name suggests – often with spectacular results (pictured below left). 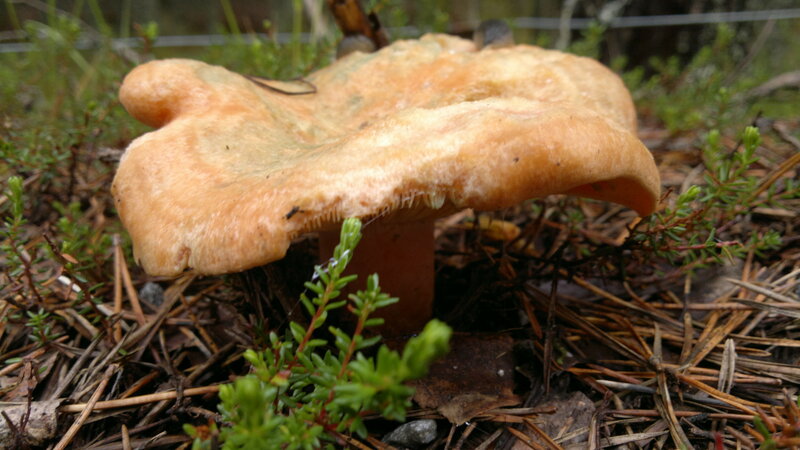 What Abernethy forest is really famous for though (apart from ospreys, capercaillie, crossbills and countless other plants and beasties) is its tooth fungi. Famous among micophiles that is. Tooth fungi represent a distinct branch of the fungi kingdom in that they bear their spores on downward pointing barbs rather than gills or pores. 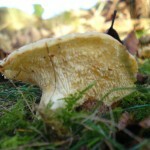 Their most prominent member is the fairly common and delicious hedgehog mushroom (hydnum repandum – centre). 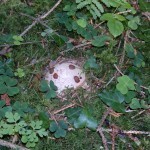 Abernethy forest is home to 12 of the other 15 tooth fungi found in the UK (and more than twice as many as are found in the whole of England as I was proudly told several times!) 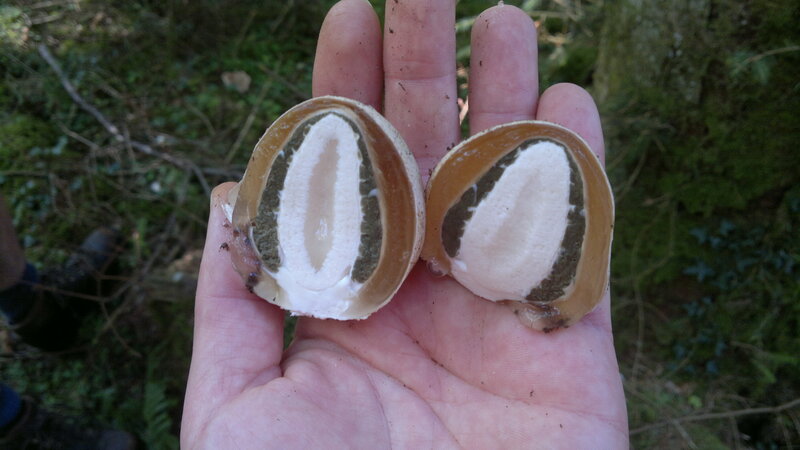 Pictured on the right is the much rarer shingled hedgehog (sarcodon imbricatum) which I have read are excellent in beefburger patties but suspect are rather too rare to be picking for the kitchen. 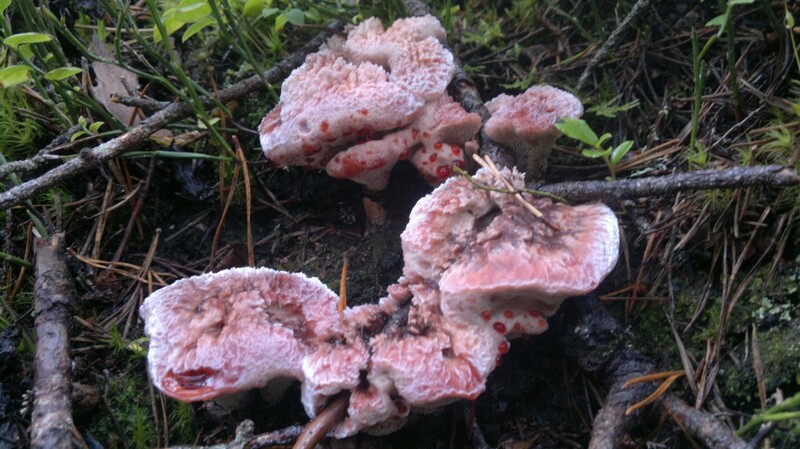 Certainly too rare to pick and inedible anyway, is the spectacularly wierd devil’s tooth (hynellum peckii). 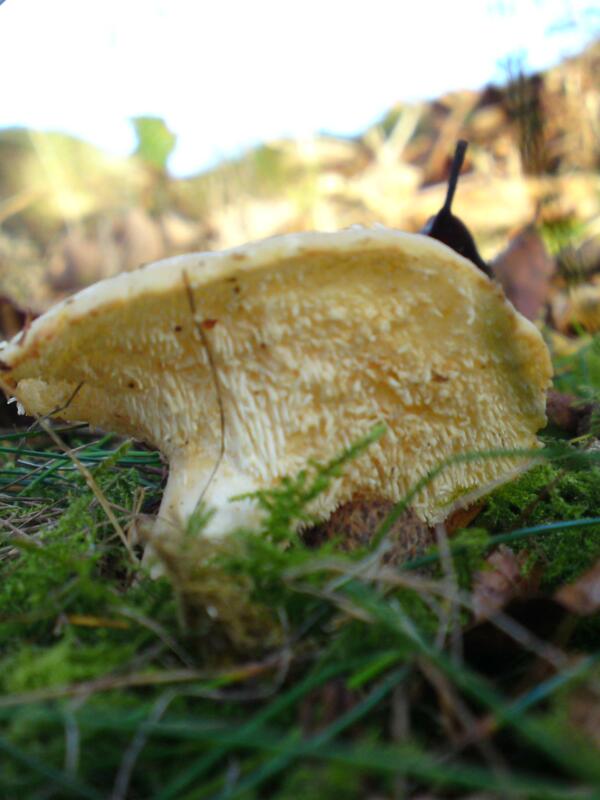 Like most tooth fungi, devil’s tooth only grows on semi-natural nutrient-poor biotopes – which Abernethy forest has in spades. 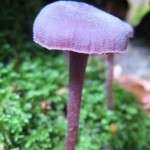 Its pink cap feels like suede and yes, they are scarlet droplets you can see in the small one in the middle. This is guttation fluid, forced out of the cap by a form of osmosis and giving the mushroom its other popular name of bleeding tooth. 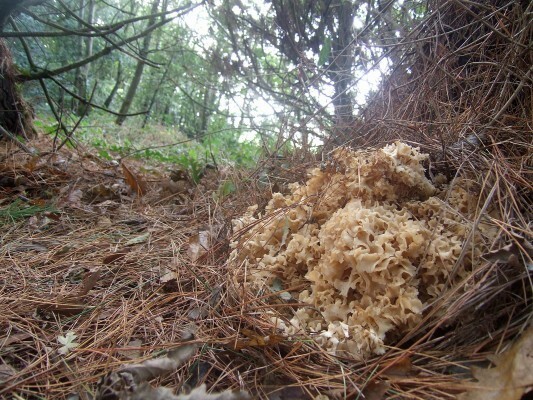 Next day we had a lovely afternoon deep in the forest searching for the spectacular, enigmatic and scrumptious cauliflower fungus (below left) – to no avail although Alison had found one a couple of years ago. I gave her a hard time for not remembering the exact tree, then consoled myself by picking a couple of punnets of orange birch bolete (almost as tasty as ceps, but actually better because they are maggot-resistant) and lots of chanterelles – which are about as easy to find up there as blackberries are in Galloway. 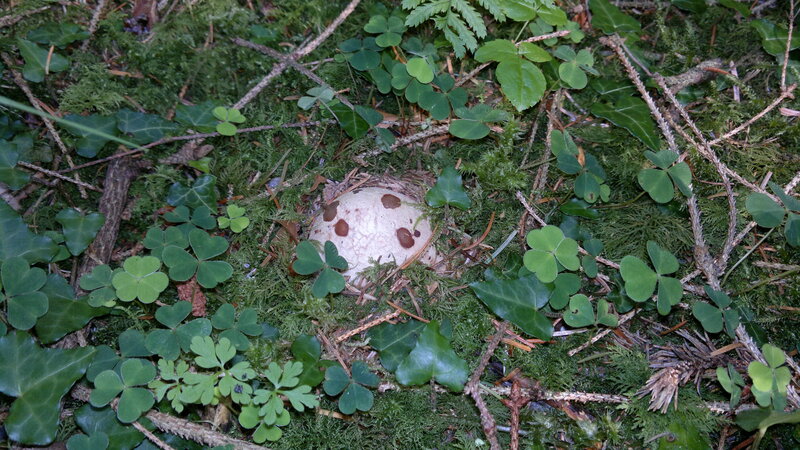 Interestingly they are mostly found along paths edges and seldom ‘off piste’ in the forest proper which is handy and curious. 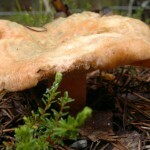 Many mushrooms are ‘boundary runners’ and nobody really seems to know why. 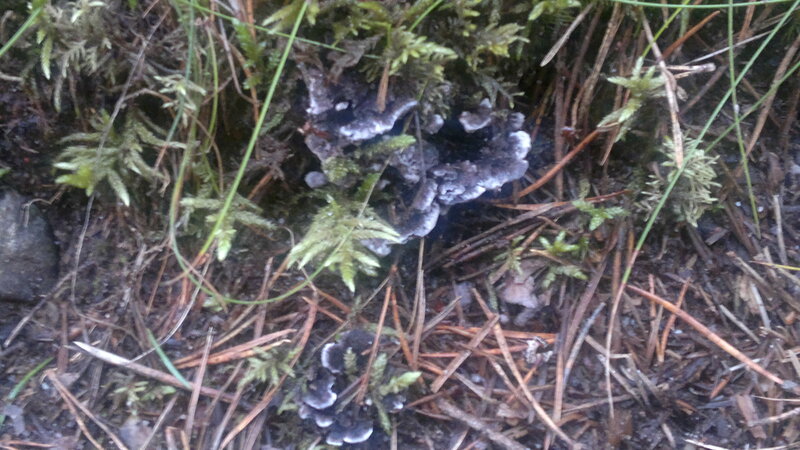 Apparently genetically identical mycelium is present further into the forest, but just doesn’t produce mushrooms. 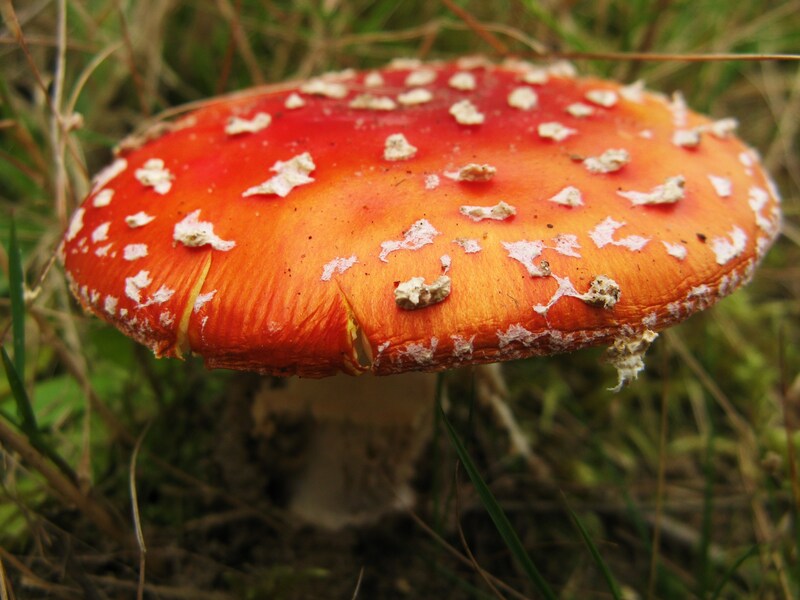 My (completely non-scientific) theory on this is that the mycelium requires mushrooms to transfer its spores over areas that it cannot pervade itself (ie. rocky, compacted, treeless paths that lack access to fine roots with which to form mycorizal relationships). That is to say that mobile mycellium has developed strategies which it intelligently deploys to overcome obstacles. I’ll write a thesis on that one day. Probably. Alison arranged for me to guide a foray for some of her (mostly ornothologically leaning) colleagues on our last evening. What she didn’t tell me until last minute was that an RSPB ecologist and the manager of the whole reserve were also coming. 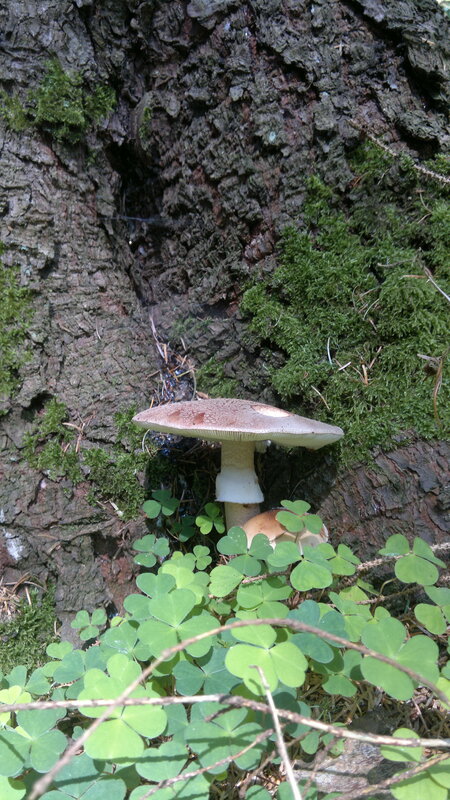 This was a little daunting but they were really pleasant and managed to feign genuine interest in my amateurish foodie take on all things mushroomy. In fact it was great having the ecologist (another Mark) there as he could identify lots of the things I couldn’t and gave me some tips on latin pronunciation. Not so much a forage as a mobile midge banquet. 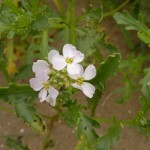 We were the wild food. Two remarkable things occurred on the walk. 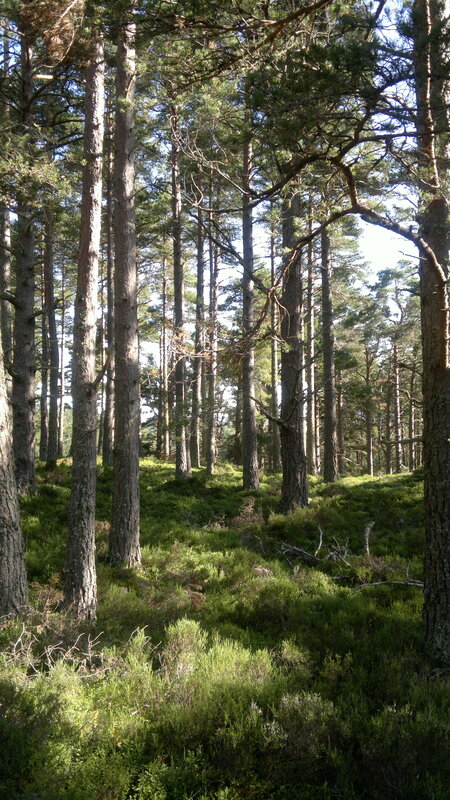 Firstly, I saw my first capercaillie. Not being much of a birder, at the time I was fairly ignorant of the momentousness of this event. I have since been informed by twitcher friends (they do have friends), that this is a sighting that many lifelong birders go to their graves without making. So having seen a category one listed species dangerously near the cusp of extinction, I now look back with awe on that 2 second flurry of treetop brownness. 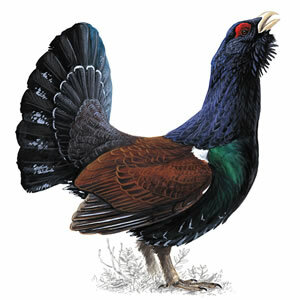 Male capercaillie. Click image to learn more. 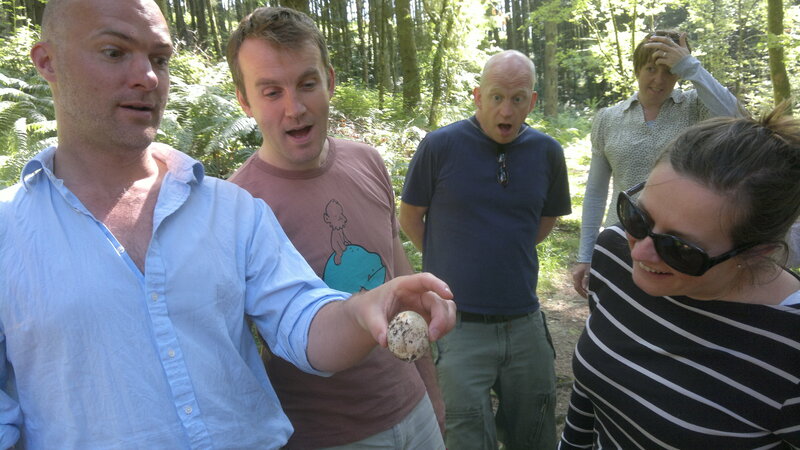 Much more momentous than this for me, however, was when ecologist Mark pointed out a species of tooth fungus that is NEW TO SCIENCE. That is to say it doesn’t even have a latin name yet. I was so excited that I managed to conveniently forget that I had COMPLETELY MISSED IT when recce-ing the walk earlier that day. I also managed to not get a decent picture of it, only this distant, blurred shot of something black and white in the heather. 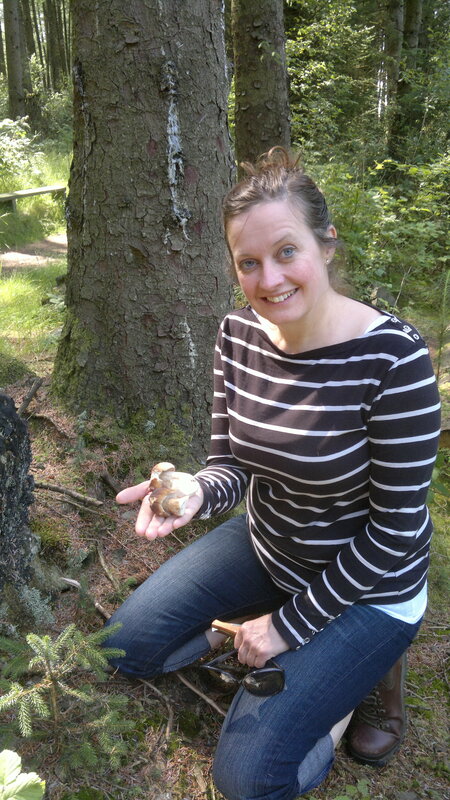 I would like to suggest the common name “capercaillie’s tail” – any other ideas? Anyway, it was a fantastic finale to an amazing few days in some truly inspirational forest. 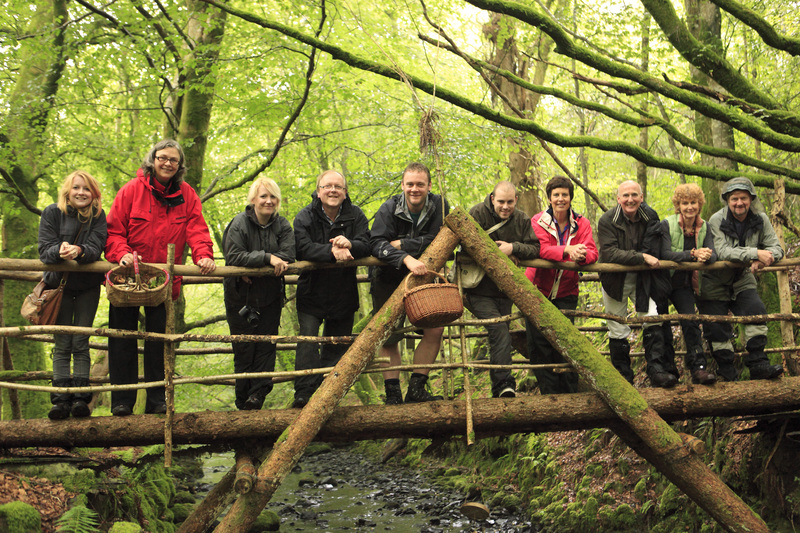 A huge thank you to Jeremy, Mark, Alison and all the dedicated nature-lovers that are working so hard to look after a rare and beautiful habitat. We had to leave the wild wet north just as the weather improved because I was guiding a foray at Cardoness back down in Galloway. 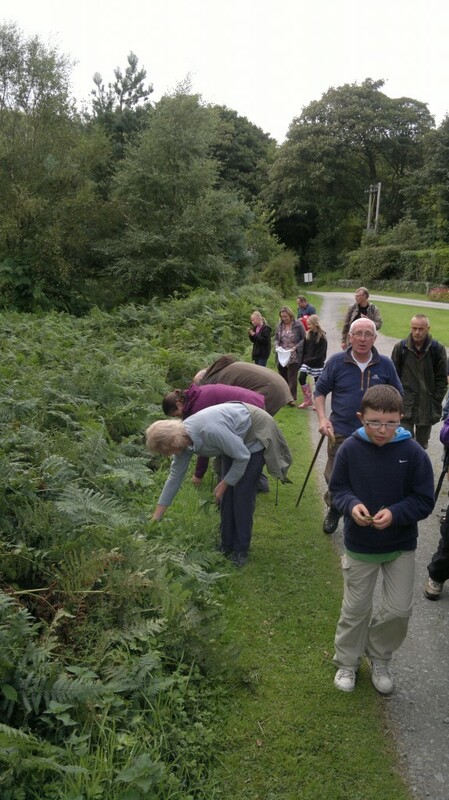 This had the joint purpose of raising funds for the mountain rescue team (we always need money for new gear and are currently trying to build a new base in Newton Stewart) and introducing some interested members of the team to the joys of foraging. 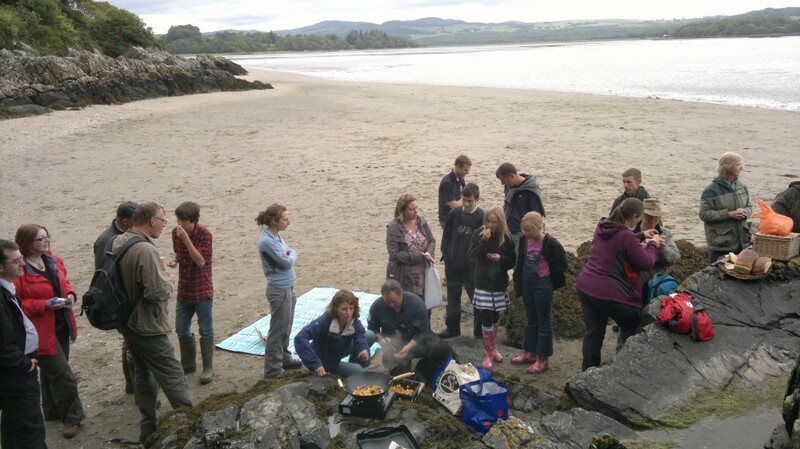 About 40 people turned up, including Mark Hannay who owns Cardoness Estate and had very kindly allowed me to use his beautiful grounds which are absolutely perfect for learning to forage, being a mixture of old woodland, hedgerows, pasture, rocky coves and tidal sand flats. Not surprisingly then, we found at least 50 different free foods without even looking that hard. 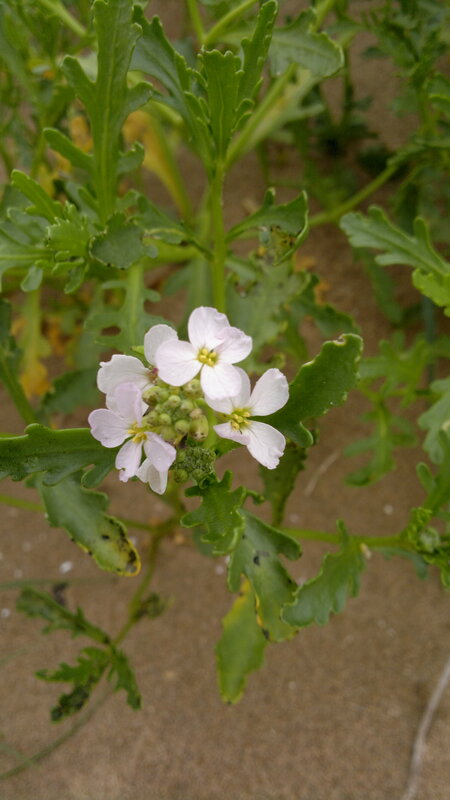 Of course they were of varying degrees of tastiness, from the nose-twistingly pungent sea rocket through the pretty but fairly innocuous tasting amethyst deceiver mushroom to the delicious radish-wasabi hit of sea radish seed pods. 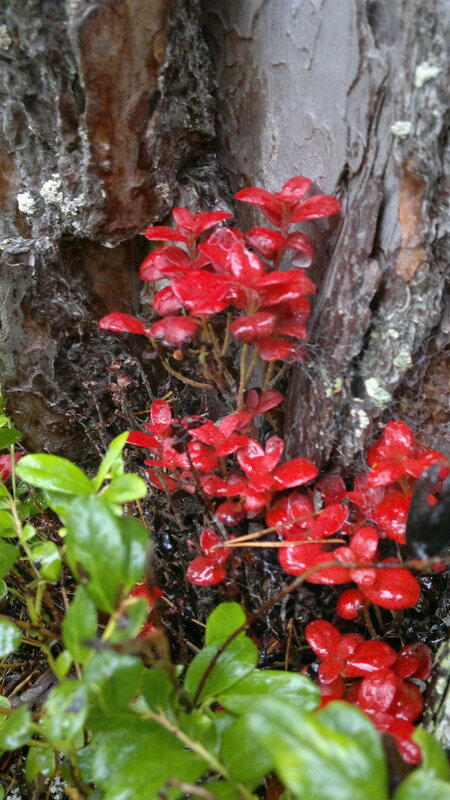 My favourite moment though, was discovering the lushest sorrel patch I have ever seen. 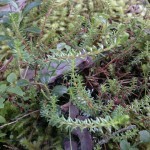 It was thriving on a grassy verge and was as tender and citrusy as it is in early spring thanks to regular mowing. I turned round to see nearly a dozen people all stooped in unison to gather it. As usual, I took my picture just too late, but you will get the idea. About 38 edible species into the foray, we decided that rather than wander miles out to the low-tide mark to look for spoots and cockles, we would enjoy a wee rest and a bite to eat by Cardoness chapel which is minute and nestles in sessile oak beside one of the shoreline’s many coves. We had found a few chanterelles by this stage but not enough for everyone, so my surplus from the Highlands that had miraculously appeared in the chapel along with some freshly baked loaves (praise be to Cara!) came in useful. After demolishing 5 loaves and 5 dishes (of mushrooms), the 500 ambled back towards the courtyard by a different route, ticking off more species and grazing black-and-blae-berries as they went. A big thank you to all who came along – I had a great evening and we managed to raise about £160 for the team. Give yourselves a big pat on the back! Great stuff Mark – you’ve been busy! 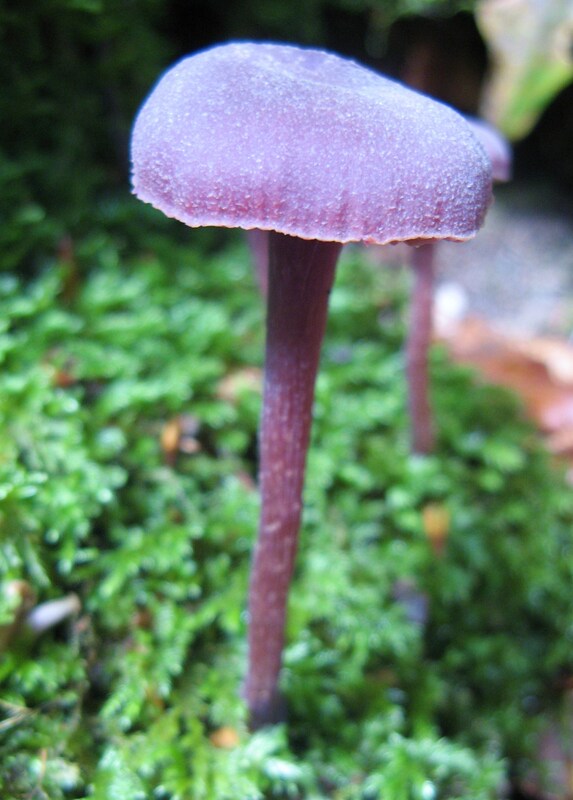 Greetings from Oregon, I recently found a toothed mushroom that you said is ” unnamed ” in your blog..my specimen looks exactly like the one pictured you are calling “capercaillies taiI” I Brought it home being the curious sort. Edge upon sitting a day or so. 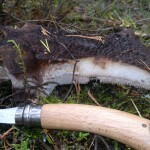 I am looking for more information about toothed beauty..I will be testing it for dye properties tomorrow. I you know anything more about it please send me a post, I would be happy to share my photos for comparison. Sorry for my slow response. 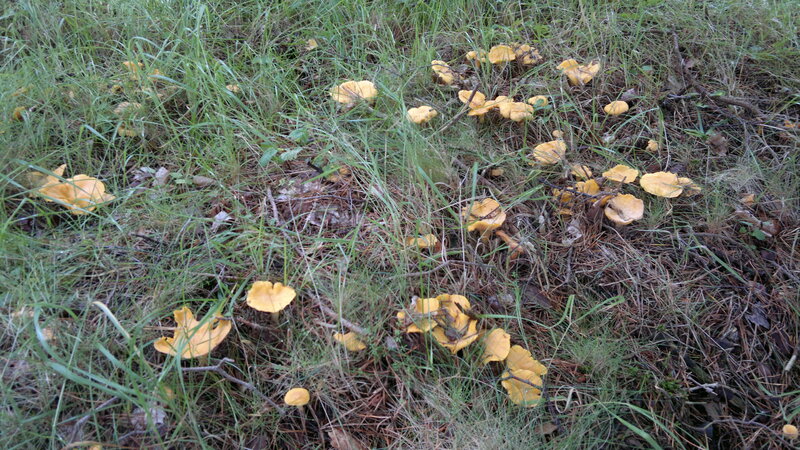 Its hard to say anything without actually seeing the fungi. Do send photos to me – by twitter FB or email. Interesting to read about your Cardoness forays, having holidayed most summers there since the late 1970s. 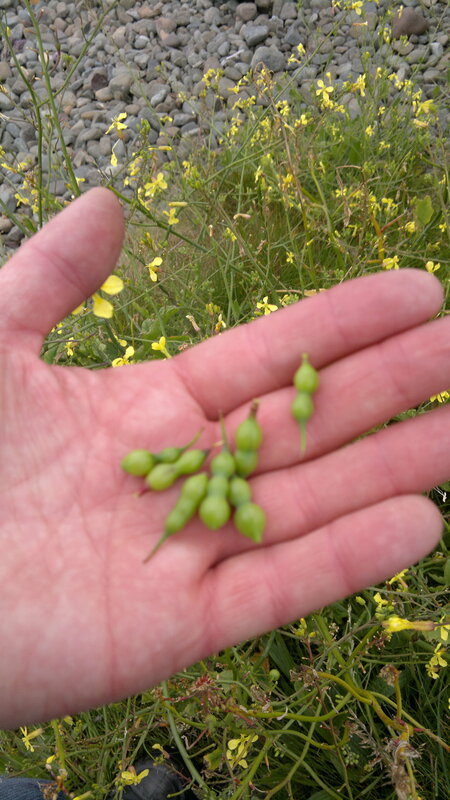 My mum and I have discussed in recent years whether you could treat sea radish seed pods (which we, before reading this, had thought was a form of rocket) as capers and pickle/preserve them. Any thoughts? 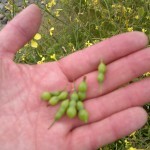 Hi Iain, Lucky you – Cardoness is amazing. I’m lucky that Mark very kindly lets me use the estate for some of my walks. 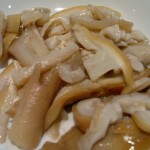 Yes, the seliques pickle very well. You need to get them before the seed hardens.